A few weeks ago, while at the park with my family, an elderly woman dressed in a sari came over to say hello. After a brief introduction, she said to us “wait here for a second” and called out “Alex…come here!” A little boy with light skin and brown hair ran over to us. The lady in the sari bent down and said to Alex, “See…this is what your grandfather looked like. He wore a turban and had a long beard just like him.” Alex wasn’t quite sure what to make of it, but he forced a quick smile and ran back to the swings. As a dastaar-wearing Sikh, I come across these interactions quite often – some pleasant, some not-so-pleasant, and some downright awkward. But because they happen so frequently, I tend to brush it off and forget all about them quickly. For some reason, this incident stuck with me. It made me think about the days in Gurmat camp decades ago when the Uncles would scare us in to keeping our kesh or else keshdari Sikhs would become a “thing of the past” and “only be seen in museum exhibits.” I never bought that theory, but the incident in the park did shake me a bit. Although Sikhi is such a large part of my life, truth is…I really don’t think about kesh much. As a matter of fact, when I lead presentations about Sikhi to Sikhs or non-Sikhs, I make a point to downplay the kesh aspect. Not that it is any less important than any of the other kakaars, but with non-Sikhs, the “mystery” behind the kesh seems to overtake discussions, and we miss some of the most important and central tenets of the faith…equality, self-less service, self-realization, and universality of the message. And even with Sikhs, kesh is made such a focus that many in our community feel that as long as we retain the external image of a Sikh, the rest of maryada and discipline does not apply. It is essentially a “free-pass” and gives us the right to criticize those who do not keep their kesh. Being the only Sikh boy in my school in the early 80’s was difficult and I always questioned why I needed to keep my kesh in the first place. I was given all kinds of answers – some said it was Guru Sahib’s way of giving us a unique identify we “couldn’t run away from” after the circumstances of Guru Tegh Bahdur’s shaheedi. Some said that hair has traditionally been a sign of saintliness, as many other saints from other religions kept long hair. Others said we should not cut something that grows naturally from our bodies (yes, the finger nail debate would quickly follow), while others gave more “alternative” reasons – that hair served as “antennae” to gather and channel energy from the sun. At a recent seminar I attended, one of the more “scholarly” elders referred to kesh as a “custom” and well, customs after time…do change. I’ve heard just about everything. Strange how I was so consumed with this question throughout most of my childhood and adolescence, but as I’ve gotten older and learned more about Gurmat, I’ve started to wonder less and less about it. 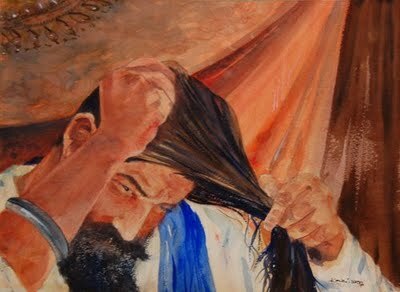 Instead, I’m consumed with what I find difficult now – waking up at amritvela, focusing on my paath, being compassionate and forgiving, letting go of my ego, attachment, and anger, seeing Waheguru in everyone…it’s as though keeping my hair is the easiest thing my Guru has asked of me…I mean, I don’t even have to try! And for everything my Guru has given me, isn’t this the least I can do as an expression of my love? In the end, we all have to come up with our own reason. Personally, I keep my kesh because my Guru has asked this of me…and I accept it as his gift – that’s it. It is neither a symbol nor a custom…it is a part of me…a part of my history. It is what Bhai Taru Singh gave his life for rather than a strand be cut. It is what Sikhs all around the world reflect upon daily in our Ardas, remembering those who gave their lives, “Kesan Suasan Naal Nibaahi” (with their hair intact, to the last breath). Just like a soldier wears his/her uniform proudly because it reflects the principles and tenets for which the country stands…my kakaars serve much the same…it represents the principles and tenets of my faith…equality, justice, service, compassion. And every time I stand before a mirror I am reminded of those principles and the code by which I live. Everyone around me is aware of it too…I cannot run away from it. And if my appearance means I am excluded from joining my co-workers at the bar after work or I’m randomly selected at airports from time to time…so be it. It is an honor and a privilege to bear the image of the Khalsa. And with my Ardaas and His grace, I shall live up to the ideals for which it stands.